When I export data to MS Dynamics CRM, what details do I need to enter in the export login page? I'm an MS Dynamics On-premise user. Can I export details from InsideView to my CRM? How do I resolve a CRMO6 Error After Installing InsideView App? How do I install InsideView in my CRM? How do I resolve a 0x800401277 Error? How can I identify which edition of MS Dynamics CRM I have? Is it possible to have a single generic username and password for Sync and Export? What information is necessary to configure “Proxy User” or “Super User”? How to pre-save the CRM settings details for InsideView Sync/Export? I am unable to use the sync/export feature in Microsoft Dynamics CRM 2011 On-premise IFDs. Which URL should I use to Sync data with IFD enabled On-premise Edition of CRM 2011? How can I export the "Industry" field from InsideView to my CRM? Despite selecting a matching record, why are other matching companies and contacts repeatedly showing up? How do I create role-based Custom Forms in MS Dynamics CRM? How to resolve : "Web Resource content size is too big"? Q: When I export data to MS Dynamics CRM, what details do I need to enter in the export login page? Please reach out to your CRM administrator for the organization name. If you are using MS Dynamics CRM Online, enter your MS Dynamics username and password. The organization name is automatically generated by InsideView. If you are using MS Dynamics Partner Hosted CRM, you will need to enter your username, password, organization name and URL. Q: I’m an MS Dynamics On-premise user. Can I export details from InsideView to my CRM? 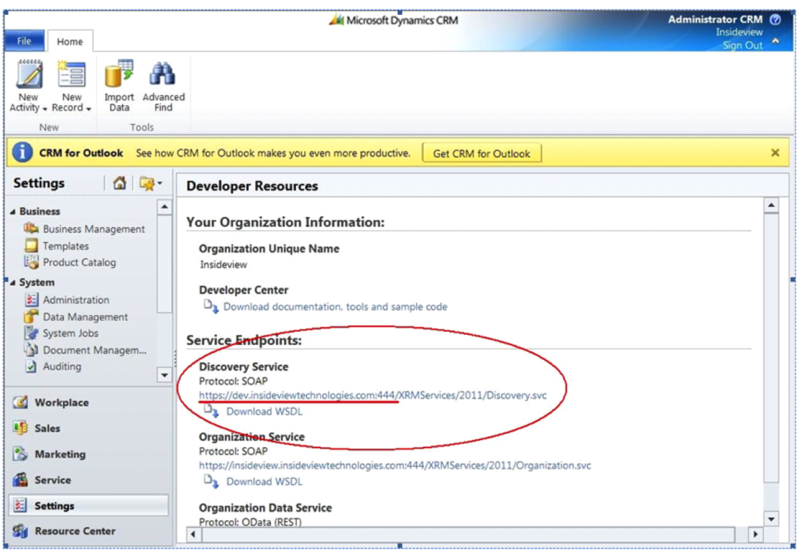 A: You can export details to your CRM only if you’re using the Internet Facing Deployment (IFD) version of MS Dynamics. The Sync/Export feature is currently not available in the Non-IFD version. For further details, please contact support@insideview.com. A: To fix this issue, log in to your CRM, go to user settings, and enter your business email. Since email is not a mandatory field in MS Dynamics CRM, you need to do this manually. Q: How do I install InsideView in my CRM? A: Navigate to http://learnmore.insideview.com/Microsoft.html and then open the installation guide for the edition of Microsoft Dynamics CRM you are using. A: To fix this issue, enter your Organization Unique Name in the Sync/Export page. A CRM Organization's unique name is the one it is referred to as internally. Please contact your CRM administrator for the information. Make sure you log in to CRM as administrator. On the left hand panel, click Settings. On the Customization window, Click Developer Resources. On the Developer Resources window, under your organization Information, find the organization unique name. For Microsoft Dynamics CRM Online, the Organization Unique Name is the first word of your CRM Online URL. Q: How can I identify which edition of MS Dynamics CRM I have? Online edition of CRMs have URLs similar to the following: https://org-name.crm.dynamics.com. Partner hosted (and On-premise IFD) CRMs use URLs similar to the following: https://org-name.partner-name.com. On-premise (non-IFD) CRMs have complex URLs. Q: Can we use one generic username and password for all users to sync and export? A: Yes, you can have one single username and password for all users to sync and export data from InsideView to your CRM. Q: What details should be kept ready while configuring a “Proxy User” or “Super User” in Microsoft Dynamics? In Microsoft Dynamics CRM 4.0, any user in the CRM who wants to be a proxy must be assigned the Proxy role, regardless of the other roles assigned to the user. For Microsoft Dynamics CRM 2011, any user in the CRM who wants to be a proxy must be assigned a Delegate role, regardless of the other roles assigned to the user. Q: How to pre-save the CRM settings details for InsideView Sync/Export? Make sure you log in to CRM as an administrator. Open an account record in your CRM and scroll down to the InsideView mash-up. On the InsideView menu, click any menu item. On the web page that opens, click Admin. Click the CRM Configuration tab. Enter the details and save the changes. Q: Why am I facing Sync/Export issues in our On-premise CRM after migrating from Microsoft Dynamics CRM 4.0 to Microsoft Dynamics CRM 2011? A: As part of CRM 2011, Microsoft no longer supports forms-based authentication for On-premise Internet Facing Deployments (IFDs). As a result, the InsideView sync/export feature is currently unavailable to On-premise deployments of Microsoft Dynamics CRM 2011. In order to continue using this feature customers can remain on their Microsoft Dynamics CRM 4 On-premise IFDs or move to Microsoft Dynamics CRM 2011 online. Please note that all other InsideView functionality remains available to On-premise deployments. Note: You will not face this issue with Partner Hosted edition. Q: Which URL should I use to Sync data with IFD enabled On-premise Edition of CRM 2011? A: We have removed the Domain Name field from the sync/export login screen for Microsoft Dynamics CRM 2011 because it is no longer required. Note: The Domain Name field is still required for Microsoft Dynamics CRM 4.0. Log in to the CRM. On the sync login screen, enter the URL from the Discovery Service section (only the underlined part in the screenshot illustrated below). Make sure you enter the CRM username and password and not that of InsideView. This is the URL that has to be used in the sync login screen even if you're using the Microsoft Dynamics CRM from within your work network. Note: The URL shown here will change if you're logged into the Microsoft Dynamics CRM from a non-IFD URL and hence it's very important to make sure you're logged in through an IFD URL before using this value. If you do not have Microsoft Dynamics CRM 2011 configured for IFD, the sync feature will be unavailable. Q: How can I export the "Industry" field from InsideView to my CRM? A: This functionality is currently not available because the Industry field is a pick-list in Microsoft Dynamics CRM and unlike some other on-demand CRM systems, MS Dynamics doesn't allow addition of new values to this field through their API (Web Services). Since there is no mapping from the InsideView industries to the industries in your CRM setup, we do not export this value during the Sync or Export functions. Q. I get the following error when trying to sync information: "Looks like we ran into an issue. There was some problem while performing this operation - Fault code: 0x800488fa, Internal error code: 0x8004348d Email Address needs to be verified: Force EASI Verification interrupt was encountered... Please contact support for assistance." Click Verify your email address on top. Check if the email address for the verification process is correct. Click Send email. Check your email inbox for the confirmation mail from windowsliveemail.com and follow the instructions to verify your email address. Once your email is verified, sign out of MS Dynamics CRM and log back in to start using the Sync/Export functionality. Q: Even after selecting a company record from multiple matching records displayed in InsideView, why does a new tab or browser window open up with the same set of matching companies and contacts? A: To resolve this, follow these steps. Under the customization window click Customize the System. On the left hand panel of the new page, click the arrow next to Entities to expand the menu. Next, click the arrow next to Contact and select Forms. When the IFRAME Properties window opens, uncheck the Restrict cross-frame scripting box. Please repeat these steps for the other entities-Account, Lead and Opportunity- where the InsideView IFRAME is published. Q: How do I create role-based Custom forms? Role-based security is one of the primary features in MS Dynamics CRM. One way to use this feature is through the use of role-based forms. A role-based custom form enables you to manage user access to specific forms. For example, a finance professional may not be allowed access to InsideView but does need to use other forms. A role-based custom form can be created and the finance professional can be given access to that specific custom form. A new custom form can be created or it can be copied from an existing form. Use the steps below to create a role-based form. 2. Click Customize the System. 3. The following screen displays. Click Entities to expand. Click Account, then click Forms. 4. On the screen below, click New or click an existing form to copy and create a new form. In the following example we are copying the Account form to create a new form. 5. The form opens and displays the following information. Click Save As then enter the required information. When you are finished click Save. 6. Once the form is created, the next step is to add role-based security to the newly created form. Return to the Forms screen, select the form to highlight it, then click Enable Security Roles. 7. Select the applicable button and choices to determine the role-based access to the form. Q: How to resolve: "Web Resource content size is too big"? 1. Go to Settings > Administration > System Settings. 2. Select the Email tab. The maximum size of files that can be uploaded is determined by the Organization.MaxUploadFileSize property. This setting limits the size of files that can be attached to email messages, notes, and Web resources. The default setting is 5MB. The Insideview Configuration (IV_Configuration) file size is 423 bytes. The IV_Configuration file will be imported without any problem to a Web resource with the default setting.